CATARMAN, Northern Samar– Tourists coming to this provincial capitol could now better enjoy their sight-seeing around town using the lowly pedicab. And it’s not just your ordinary pedicab, a tricycle with a two-seat compartment covered with a folding top with a separate for the driver, as it is designed with native products of banig, bamboo pole, coconut husk and shells. Maria Josette Doctor, provincial tourism officer, said that using the locally-designed pedicabs will be of big come-on to tourists who want to see Catarman, particularly its tourist spots or destinations. “It’s really the pedicabs that brings you around especially in Catarman which has narrow roads. This is a brilliant idea to use them in a tour instead of using vehicles,” she added. 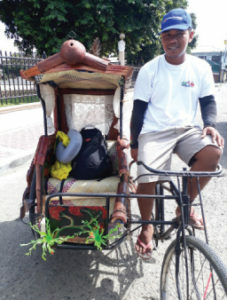 The tourist-friendly pedicabs was designed by Alyanna Angelika Ambos,12, a student of the Center for Arts, Recreation and Education (CARE) Foundation in Catarman. “I’m proud of my design because it shows local products that are available in my town. People appreciate it,” Ambos said. Romulo Barandino Jr., one of the pedicab-drivers trained to ferry tourists, said that they are thankful to the people who conceptualized the pedicab tour. He said that aside from an increased income, the program also boosted their morale and gave them opportunity to learn on tourism. The 10 drivers plying the specially-design pedicabs earn as much as P400 a day just touring around the tourists around town. The local tour was launched by Gusto Avventura owned by Kathrina Marigold Jusa. “Catarman is untouched and has lot of potentials for tourism especially for the pedicab,” she said. “Everything is here, it is really a local emersion if you will avail of the pedicab tour,” Jusa added. Part of the tour, which was only launched October of this year, include watching local athletes play sepak takraw, the country’s national sport and a popular sport in Catarman. After that, tourists will be tour to watch how the locals cook their special delicacies like pinangat and piñato, a delicacy made from pop rice, caramelize sugar, and rice cracker called koping, then in the nearby town of Bobon and minoron in Catarman. They will also be ferried to Buko Island where they can witness how the locals make one of their premium products–copra with free refreshments. A farm tour also highlights the experience, wherein they can ride a carabao and experience the local’s way of life in the vast rice fields. Part of the tour is a boodle fight at the Rancho Gloria, which is owned by the family famous celebrity costume player Alodia Gosiengfiao and a stay in cozy yet affordable hotels like the Sangkay Suites which room rates cost P2, 500 to P3,500 for a two-storey condominium type rooms with kitchen and in Carmel Inn which room rates starts at P650 to P2,200 for an executive room.